This has been described as “the stained glass cake” - Packed with the highest quality dried and glacèd fruit and whole crunchy brazil nuts, almonds and walnuts. This cake is a real treat for that grand afternoon tea. Cut into elegant slices as the perfect end to a special meal with coffee. 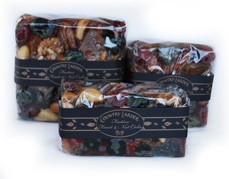 A traditional spicy rich fruit cake made with a scrumptious selection of the finest quality brandy soaked dried and glacèd fruits, producing a divine gourmet cake for that special occasion. 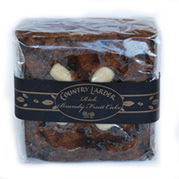 Make this an addition to your Christmas shopping to eat as is or warmed and served with brandy butter. This wickedly wonderful spread combining zesty limes and lemons, fresh eggs and butter and its tipsy flavour of advocaat and brandy make this an irresistible taste sensation, Just open up the jar and throw away the lid. Delicious as a spread for toast or scones. Divine with pancakes or straight from the jar. A great gift idea. Each small crate holds 3 x 110g jars and you can choose from jams, savoury, mustards or mixed.